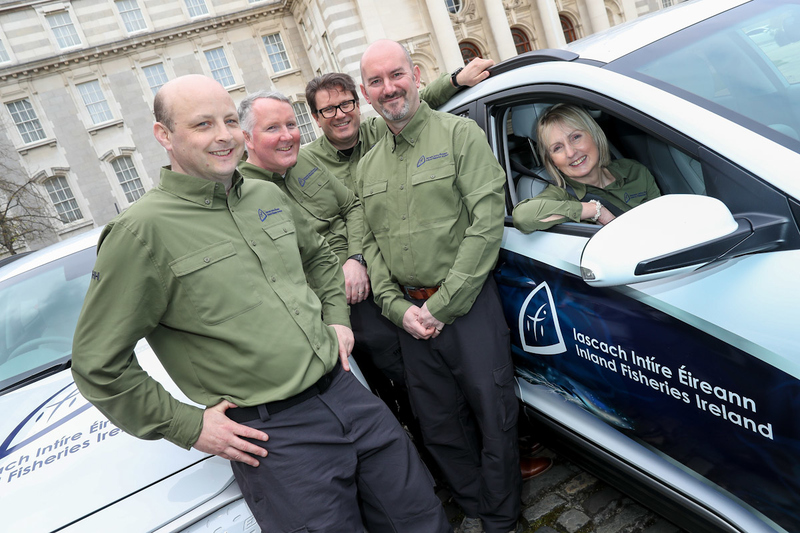 An Taoiseach Leo Varadkar launched Inland Fisheries Ireland’s electric fleet of cars along with Richard Bruton TD, Minister for Communications, Climate Action and Environment and Sean Canney TD, Minister with responsibility for the inland fisheries sector. The organisation is introducing energy efficient vehicles with a view to achieving a 24 per cent reduction in the Co2 emissions from its fleet. The electric vehicles have been wrapped in a fish themed design with an electrically charged eel swimming across the side to promote the organisation’s shift to zero emission cars. Taoiseach Leo Varadkar said: "I am pleased that Inland Fisheries Ireland is setting a really positive example by switching to a more carbon friendly fleet. As a country we all need to do more to tackle climate action, so it is important to see our public bodies taking the lead. We will all need to make adjustments to how we live and how we get around; these cars will send a positive message, as well as reducing the carbon footprint of the organisation." Richard Bruton TD, Minister of Communications, Climate Action and Environment said: "It is vital that every aspect of our society seek ways to reduce their carbon impact and the public service must be the first to show that it takes policies for sustainability seriously, if we are to persuade the rest of society to make the step changes which we need to make. Today’s announcement shows that Inland Fisheries Ireland are leading by example and making changes to adapt. As a result of this new electric fleet, they will reduce their carbon footprint by 24 per cent." Inland Fisheries Ireland has over 300 staff with many using vehicles to allow them to carry out their protection, environmental, promotional and research duties. Ireland has 5,600km of coastline, 70,000 kilometres or rivers and streams and 144,000 hectares of lakes and ponds, all of which fall under Inland Fisheries Ireland’s remit. In addition to moving to energy efficient vehicles, the organisation has implemented a fleet management system to generate additional efficacies and to ensure the fleet is being used in the most appropriate manner and that driver safety remains a priority. Dr Ciaran Byrne, CEO of Inland Fisheries Ireland said: “The energy reduction target of 33 per cent by 2020 is an opportunity to refocus the philosophy of our organisation. As an environmental agency, we are very aware of the critical nature of climate change and the impact it is having on our fisheries resource. We are looking at every aspect of our work to see how we can reduce our environmental footprint. The move to ‘green’ vehicles is just one of many changes which we are making to ensure we reduce our overall emissions.